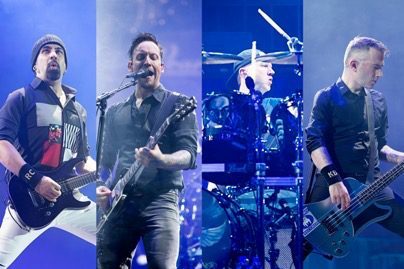 14 December 2018 (TORONTO, ON) - August 26, 2017, VOLBEAT became the first Danish band to headline and sell out their hometown venue, Denmark’s Telia Parken, setting the record for the biggest show by a domestic artist in Denmark ever with over 48,250 people in attendance. To commemorate and immortalize the record-breaking event, the band releases their live album and concert film, Let’s Boogie! Live From Telia Parken. Said lead singer Michael Poulsen about the historic show: “Headlining Telia Parken was a dream come true, and we’re humbled and honored that so many members of the Volbeat family came from far and wide to celebrate with us. We’re thrilled to be able to share what was a milestone night for us with everyone.” The album and concert film are available in the following configurations: BluRay /2 CD, DVD/2 CD, 2 CD, 3 LP vinyl, and digitally through all major DSPs. Recently, Volbeat confirmed seventeen new tour dates with Godsmack throughout the U.S. and Canada in April and May of 2019. The tour will kick off with a string of dates in U.S. as special guests to Godsmack before the pair embark on a cross-country coheadline tour of Canada (full dates below). Additionally, two tiers of enhanced experiences will be available for these dates, a “Meet & Greet + Backstage Tour Experience” and a “Fast Track + Early Entry Package,” and full information is available here. Tickets for all newly announced dates are on sale here (with the exception of the Saskatoon date, which will go on-sale Saturday, Dec. 15 at 10am Local Time). The 26-track Let’s Boogie! Live From Telia Parken, includes live versions of VOLBEAT’s chart-topping hits “For Evigt,” “The Devil’s Bleeding Crown,” “Still Counting,” and “A Warrior’s Call” as well as a live performance of a new song, “The Everlasting.” Special guests on the album (in order of appearance) include Mille Petrozza, Johan Olsen, Mark “Barney” Greenway, Lars Ulrich, boxer Mikkel Kessler and Danko Jones. Find a full list of guest performers below.